Fadal VH65 4 th Axis 6 ½” Rotary Head s/n 052002061351 w/ Mill Center, Yuasa 4 th Axis 5C Rotary Head w/ Yasnac PNC-100 Servo Controller and Mill Center, Hardinge 4 th Axis 5C Rotary Head s/n 197 w/Hardinge Servo Controller, (450) BT-40 Taper Tooling, (7) Huot Toolscoot 40-Taper Tooling Carts, (4)Chick 4-Station 4” Double-Lock Vise Tombstones, (3) Kurt 6” Double-Lock Vises, (20) Kurt 6” Angle-Lock Vises, (500) 5C Collets and Step Chucks, (45) 16C Collets, (3) 5C Indexing Heads, Mill Centers, Tapmatic Tapping Heads, 6” x 12” Sine Table, Vidmar (2) 15-Drawer, 12-Drawer, (2) 9-Drawer, (2) 6-DrawerTooling Cabinets, Lista 9-Drawer Tooling Cabinet, Lista 12-Drawer Tooling Cabinet, (24) Huot Drill and Tap Cabinets, Insert Milling, Drills, Threading, Grooving, Turning and Boring Tooling, Drills, Taps,Reamers, Carbide and HS Endmills and Perishable Tooling. Mitutoyo PH-350A 13” Optical Comparator s/n 8273 w/ Mitutoyo DRO, Surface and Profile Illumination, Bench. Vision Mantis FX Optical Viewing Scope, Science No. 1 6”” x 12” Bench Center, Mitutoyo Absolute 12”Digital Height Gage, Mitutoyo Gage Block Sets, Mitutoyo Indicator Stands w/ Mitutoyo Digital Drop Indicators, Mueller Dial Groove Gage, Mitutoyo 6”-24” Digital Calipers, Mitutoyo 6”-40” Dial Calipers, iGaging 0-3” Digital OD Mic Set, Mitutoyo Digital OD Mics, Mitutoyo 0-6” Digital Depth Mic, Etalon 0-1” Indicating OD Mic, Mitutoyo OD Mics to 6”, Mitutoyo 1”- 2”, 0-1” Thread Pitch Mics, Mitutoyo 2”-3”, 1”-2”, 0-1” Blade Mics, Mitutoyo 1”-2”, 0-1” Disc Mics, Mitutoyo 0-1” Spline Mic, Mitutoyo 0-1” Point Mic, Mitutoyo 0-6” and 0-3” Depth Mics, Brown &amp; Sharpe 6”-7” Bore Mic, Mitutoyo 2”-6” Dial Bore Gage, Meyer Pin Gage Cabinets 0.011”-.750”, (2) 0.061”-.750”, .751”-1.000”, Mojave 36” x 48” x 6 ½” Grade “A” Granite Surface Plate w/ Stand, Starrett Crystal Pink 18” x 24” x 6” Grade “A” Granite Surface Plate w/ Roll Stand. Clark GCX15E 3000 Lb Cap LPG Forklift s/n GX127E-0109- 9347FB w/ 2-Stage Mast, 122” Lift Height, Side Shift, Cushion Tires. 11 ¾” x 11 ¾” Pallets, Travels X=17.1”, Y=15.74”,Z=15.74”, Coolant. 1995 Fadal VMC6030HT mdl. 907 CNC Vertical Machining Center s/n 9510060 w/ Fadal CNC88HS Controls, 21-Station ATC, BT-40 Taper Spindle, 7500 Max RPM, Rigid Tapping, High Speed CPU, Graphics, Hand Wheel, 30” x 62” Table, Coolant. 2001 Fadal VMC4524 mdl. 922 4-Axis CNC Vertical Machining Center s/n 032001112911 w/ Fadal Multi Processor CNC Controls, 24-Station Side Mounted ATC, BT-40 Taper Spindle, 10,000 Max RPM, Travels X=60”, Y=30”, Z=30”, Rigid Tapping, Extended “Z” Axis, Servo Coolant, Chip Wash Down, Chip Auger, 25”x 48 ½” Table, Coolant. 2000 Mori Seiki MV-40E 4-Axis CNC Vertical Machining Center s/n 1127 w/ Mori Seiki MSC-500 Controls,20-Station ATC, BT-40 Taper Spindle, 10,000 Max RPM, Travels X=22.05”, Y=16.14”, Z=18.11”, Oilmatic Oil Cooler, 17 ¾” x 35 ½” Table, Coolant. 1995 Mori Seiki MV-40/40 CNC Vertical Machining Center s/n 3857 w/ Yasnac Control Console, 20-Station ATC, BT-40 Taper Spindle, 8000 Max RPM, Travels X=32”, Y=16”, Z=20”, Oilmatic Oil Cooler, 17 ¾” x 43 ¼” Table, Dual Chip Conveyors, Coolant. 1994 Mori Seiki MV-40 CNC Vertical Machining Center s/n 3610 w/ Yasnac Controls, 20-Station ATC, BT-40 Taper Spindle, 8000 Max RPM, Travels X=32”, Y=16”, Z=20”, Oilmatic Oil Cooler, 17 ¾” x 43 ¼” Table, Coolant. 1993 Mori Seiki MV-40B CNC Vertical Machining Center s/n 2111 w/ Yasnac Controls, 20-Station ATC, BT-40 Taper Spindle, 8000 Max RPM, Travels X=32”, Y=16”, Z=20”, Oilmatic Oil Cooler, 17 ¾” x 43 ¼” Table, Coolant. 1991 Mori Seiki MV-40 CNC Vertical Machining Center s/n 2335 w/ Yasnac Controls, 20-Station ATC, BT-40 Taper Spindle, 8000 Max RPM, Travels X=32”, Y=16”, Z=20”, Oilmatic Oil Cooler, 17 ¾” x 43 ¼” Table, Coolant. 1991 Mori Seiki MV-40 CNC Vertical Machining Center s/n 1274 w/ Yasnac Controls, 20-Station ATC, BT-40 Taper Spindle, 8000 Max RPM, Travels X=32”, Y=16”, Z=20”, Oilmatic Oil Cooler, 17 ¾” x 43 ¼” Table, Coolant. 1991 Mori Seiki MV-40 CNC Vertical Machining Center s/n 1132 w/ Yasnac Controls, 20-Station ATC, BT-40 Taper Spindle, 8000 Max RPM, Travels X=32”, Y=16”, Z=20”, Oilmatic Oil Cooler, 17 ¾” x 43 ¼” Table, Coolant. 1994 Matsuura MC-600VF CNC Vertical Machining Center s/n 941110876 w/ Yasnac System i-80Controls, 20-Station ATC, BT-40 Taper Spindle, 8000 Max RPM, Oilcon Oil Cooler, 15 ¾” x 34 ½” Table,Coolant. 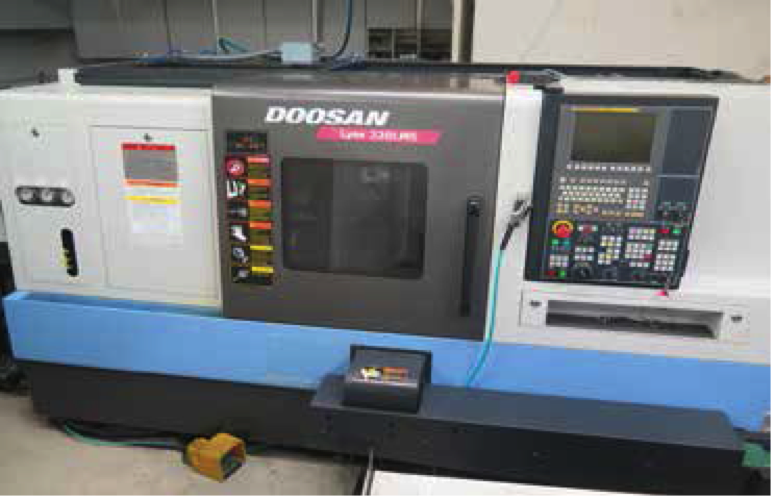 2014 Doosan LYNX 220 LMSA Twin Spindle Live Turret CNC Turning Center s/n ML0213-0002222 w/Doosan Fanuc i-Series Controls, Tool Presetter, 12/24 Station Live Turret, 12-Live Stations, 6000 RPM Main Spindle, 6000 RPM Sub Spindle, “C” Axis Rotation @ 0.001 Degrees, 2” Thru Main Spindle Bore,6000 RPM Rotary Tooling (Live Turret), 7” 3-Jaw Main Spindle Power Chuck, 5 ¼” 3-Jaw Sub Spindle Power Chuck, 16C Main and Sub Spindle Dead Length Spindle Noses, (2) Radial and (2) Axial Preci-Flex Live Turret Tooling with Taper Tooling Holders, Parts Chute and External Parts Conveyor, Coolant, LNS Alpha SL65S Automatic Bar Loader / Feeder s/n 29041201. 1999 Mori Seiki SL-150/500 CNC Turning Center s/n 1062 w/ Mori Seiki MSC-500 Controls, Tool Presetter, 12-Station Turret, Hydraulic Tailstock, 50-5000 RPM, 2.2” Thru Spindle Bore, 7” 3-Jaw Power Chuck, Coolant. 1996 Hwa Cheon Hi-ECO31A CNC Turning Center s/n M0573-43121- 43 w/ Fanuc 0-T Controls, Tool Presetter, 12-Station Turret, Hydraulic Tailstock, 3200 Max RPM, 10” 3-Jaw Power Chuck, 15” Max Turning Dia., 23.6” Max Turning Length, 2.75” Thru Spindle Bore, Coolant. HEM Saw mdl. H90-A- B/F 12” Automatic Horizontal Band Saw s/n 748700 w/ HEM Controls, PneumaticClamping and Feeds,, Coolant. Powermatic mdl. 87 20” Vertical Band Saw s/n 087362 w/Blade Welder, 24” x 24” Table. Pistorius 14” Abrasive Sliding Table Miter Saw w/ Coolant. 2016 Darex V-390 Precision Drill Sharpener s/n 39002669. Enerpac 50 Ton Electric-Hydraulic H-Frame Press. Kalamazoo 4” Belt / 10” Disc Sander w/ Stand. (2) Abrasive Finishing Inc. “Super Quiet Burr Bench” Media Tumblers. Orbit Bench Model Drill Press. 1991 Kaeser SK25 20Hp Rotary Air Compressor s/n 0268386 w/ 92 CFM @ 110 PSIG, 20,990 Hours, Kaeser KRD125 Refrigerated Air Dryer, Kaeser Oil-Water Separator, 80 Gallon Air Storage Tank.